Clockwise from top left: Cathedral of Christ the Saviour; Spasskaya Tower of the Moscow Kremlin; MIBC; Red Square, Saint Basil's Cathedral; Bolshoi Theatre; and Moscow State University. Moscow (Russian: Москва, "Moskva") is the capital city of Russia. 11.5 million people live there (since 1 October 2010), so it is Europe's biggest city. It is also the seventh biggest city in the world. Moscow is an important political, cultural, economic, religious, financial and transportation center. It is a global city, important in the economic infrastructure of the region. 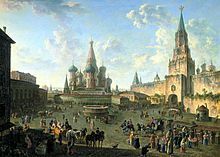 Moscow was founded by Prince Yuri Dolgoruki in 1147. The middle of the city is an ancient walled city called the Kremlin. There are important government buildings, museums and churches in the Kremlin. Many of the buildings in Moscow, like St. Basil's Cathedral and Spasskaya Tower, are very beautiful and famous. There are also modern buildings. The many art galleries have big collections. Moscow has many scientific and educational buildings, as well as some sports complexes built for the 1980 Summer Olympics. Transport includes four international airports, nine railroad stations and the second busiest (after Tokyo) metro system in the world, which is famous for its artwork. Over time, the city has earned a variety of nicknames, most referring to its pre-eminent status in the nation: The Third Rome (Третий Рим), Whitestone (Белокаменная), The First Throne (Первопрестольная), The Forty Forties (Сорок Сороков), The Port of five seas (Порт пяти морей). Moscow has a large economic infrastructure. It is home to the most billionaires in the world. In 2008 Moscow was named the world's most expensive city for non-Russian workers for the third year in a row. In 2009, however, Moscow went down to third after Tokyo and Osaka came in first and second. Under Ivan I the city replaced Tver as a political center of Vladimir-Suzdal and became the only collector of taxes for the Mongol-Tatar rulers. By paying high taxes, Ivan worked out an important deal with the Khan. Unlike other principalities, Moscow was not divided among his sons but was passed whole to his oldest. However, Moscow did not like the Mongol rule. In 1380, prince Dmitry Donskoy of Moscow led a Russian army to an important victory over the Tatars in the Battle of Kulikovo. 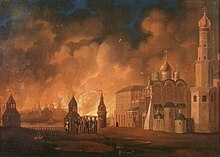 Only two years later Moscow was raided by the Khan Tokhtamysh. In 1480, Ivan III finally broke the Russians free from Tatar control, allowing Moscow to become the center of power in Russia. Under Ivan III the city became the capital of an empire that would eventually include all of Russia and other countries. In January 1905, Alexander Adrianov became Moscow’s first mayor. 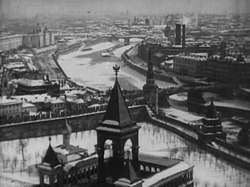 After the Russian Revolution of 1917, on 12 March 1918 Moscow became the capital of the Soviet Union. During World War II (known in Russia as the Great Patriotic War), after the German invasion of the USSR, the Soviet State Defense Group and commanders of the Red Army were placed in Moscow. In 1941, 16 groups of national volunteers (more than 160,000 people), twenty-five battalions (18,500 people) and four engineering regiments were created among the Muscovites. That November, the German Army was stopped at the edge of the city and then driven off in the Battle of Moscow. Many factories were moved away, and much of the government was too, and from 20 October the city was declared to be under siege. Its people who stayed built and used antitank defences, while the city was bombed from the air. Joseph Stalin (the leader of Russia) did not leave the city, so the general staff remained in the city as well. Even with a siege going on, the building of the Moscow Metro system continued through the war, and by the end of the war a few new metro lines were opened. ↑ Comins-Richmond, Walter. "The History of Moscow". Occidental College. Archived from the original on May 17, 2006. Retrieved July 3, 2006. ↑ "Holidays and significant dates of Moscow". Moscow City Government. Archived from the original on August 23, 2011. Retrieved September 29, 2010. ↑ 5.0 5.1 "The Moscow City Mayor". Government of Moscow. Archived from the original on August 23, 2011. Retrieved March 18, 2010. ↑ "The Moscow Statute". Moscow City Duma. Moscow City Government. June 28, 1995. Archived from the original on August 23, 2011. Retrieved September 29, 2010. The supreme and exclusive legislative (representative) body of the state power in Moscow is the Moscow City Duma. ↑ 03.08.2011 "О совместных предложениях Правительства Москвы и Правительства Московской области по изменению границ столицы Российской Федерации — города Москвы" Check |url= value (help). Mos.ru. October 25, 2010. Retrieved July 9, 2014. ↑ "Muscovite" (in Russian). dic.academic.ru. Retrieved 2010-02-15. ↑ "Underground Roads, Boulevards and Malls To Be Built Underneath Moscow". Pravda.ru. 2009-10-01. Retrieved 2009-10-05. ↑ "Moscow becomes world's billionaire capital — Forbes". RIA Novsoti. Retrieved 2008-03-05. ↑ Comins-Richmond, Walter. "The History of Moscow". Occidental College. Retrieved 2006-07-03. ↑ "Along the Moscow Golden Ring" (PDF). Moscow,Russia Tourist Information centre. Retrieved 2006-07-05. ↑ Vogel, Michael. "The Mongol Connection: Mongol Influences on the Development of Moscow". Indiana University South Bend. Retrieved 2006-07-03. ↑ "Geographi". The Russian Embassy. Retrieved 2009-03-08. ↑ "Twin Towns". www.amazingdusseldorf.com. Retrieved 2010-02-15. ↑ "Twinning Cities: International Relations" (PDF). Municipality of Tirana. www.tirana.gov.al. Retrieved 2010-02-15. ↑ "Cooperation Internationale" (in French). © 2003–2009 City of Tunis Portal. Retrieved 2010-02-15. ↑ "Miasta partnerskie Warszawy". um.warszawa.pl. Biuro Promocji Miasta. 2005-05-04. Retrieved 2010-02-15. This page was last changed on 24 September 2018, at 22:14.